This three part tutorial is appropriate for all viewers. The full tutorial introduces the Terrorism and Extremist Violence in the United States (TEVUS) Portal, provides a general overview of the portal, and guides viewers through a general use case. 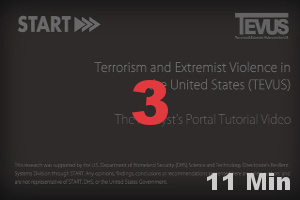 For convenience, the TEVUS Portal Tutorial videos are provided as one full-length video and again as three separate parts. Part One introduces the TEVUS database, describes portal components, and highlights the benefits of using TEVUS. Viewers learn about the four open source databases used to create the underlying TEVUS database, the four data types and four panels included in the portal, and the definitions of the six color coded nodes representing data elements in the portal. 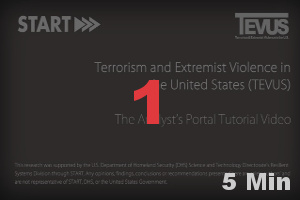 Finally, the tutorial video reviews the many benefits associated with using the TEVUS Portal. Part Two provides a general overview of the portal itself. Viewers are introduced to the four panels including the relational graph panel, the map panel, the timeline panel, and the summary narrative panel; the portal dashboard; and, the panel toolbars. By the end of Part Two, viewers will be able to navigate the portal and have a basic understanding of how to build a search query. Part Three of the tutorial includes a general use case. The use case demonstrates how to use the TEVUS Portal to answer a specific question. It provides a step-by-step guide on selecting a focus element for a search query, refining a search, and navigating each panel to examine results. Viewers will be able to apply these skills to building new search queries. The Basic Use Cases are designed to provide simple step-by-step guides on how to build searches using each of the data types: group, event, person, and court case. Each Basic Use Case Tutorial highlights selected portal features that can be used to enhance each search. The Basic Use Cases are appropriate for a general audience including but not limited to students, researchers, members of law enforcement, analysts, journalists, and individuals in the private sector. 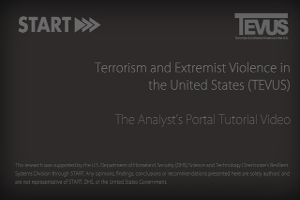 This Basic Use Case Tutorial follows Bill, a journalist who is writing a report about violent incidents and plots insides the U.S. committed by or attempted by al-Qaida and its other related groups. In this tutorial, Bill uses TEVUS to identify related groups and explore their relationships with al-Qaida. Viewers will learn about several features unique to the relational graph panel including examining the data in cluster view and using the shortest path function. 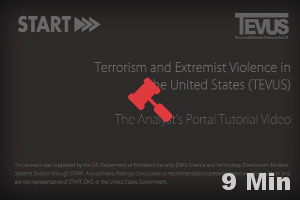 This Basic Use Case Tutorial follows Jin, an analyst at a regional fusion center, who has been asked to research information about terrorist attacks in the U.S. since 2003. Jin uses TEVUS to build a search query focusing on events to determine the number and location of incident acts and extremists crimes which happened in a specific timeframe. In this tutorial, viewers will learn how to apply filters and download a table and a map displaying the location of the incident acts and extremist crimes. This Basic Use Case Tutorial follows Sally, a student who is preparing a case study presentation on Timothy McVeigh for a course titled “Psychology of Aggression.” Sally uses TEVUS to build a search focusing on a specific person. In this tutorial, viewers will explore individual nodes, using the features found in the pop-up boxes to further examine source information and find the location of a specific incident act on the map. This Basic Use Case Tutorial follows Grant, a private investigator and bounty hunter, who uses TEVUS to find out more information about Josephine Sunshine Overaker, an individual who appears on the FBI’s Most Wanted for Domestic Terrorism list. Grant builds a search query focusing on the court case in which Ms. Overaker was indicted. In this tutorial, viewers will learn how to change the focus element within an existing search, how to explore additional source information about a specific incident act, and how to isolate information about a specific data element within a search. The Advanced Use Cases are designed to assist TEVUS end users such as members of law enforcement, researchers, students, or journalists learn how to build optimal searches in TEVUS. The first step in making the best use of TEVUS is to fully understand the complexities of building effective searches. This Advanced Use Case follows Gary, a journalist working for a national newspaper who is writing a story on the ISIL's influence in western countries. In this tutorial, Gary uses TEVUS to build the optimal search to help answer this question. 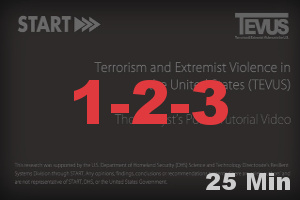 Viewers will learn about how groups are defined in TEVUS, the various options for building a search, and how what is known about ISIL itself can be used to help narrow the search. This advanced Use Case follows Erin, a Sheriff's Deputy who is interested in learning more about the threat the sovereign citizen movement. In this tutorial, Erin uses TEVUS to build the optimal search to help her understand what is known about activity related to the sovereign citizen movement in the United States. Viewers will learn about how groups are defined in TEVUS, the various options for building a search, and how using ideology can help produce the most complete results. This Advanced Use Case follows Amy, an intelligence analyst at the New Jersey Office of Homeland Security and Preparedness who is interested in identifying violent white supremacist group activity in her region. In this tutorial, Amy uses TEVUS to build the optimal search to help answer this question. Viewers will learn how to apply filters in order to search by jurisdiction, exclude data points, access the User Guide to answer a question, submit an email to the TEVUS support team, and complete a follow-up search. Please note the use case tutorials were developed and recorded using a test load of TEVUS data spanning from 1970-2013. The data currently available through the TEVUS Portal has been updated and reviewed for quality and consistency. Therefore, the returned results seen in each of the video tutorials may no longer be accurate.